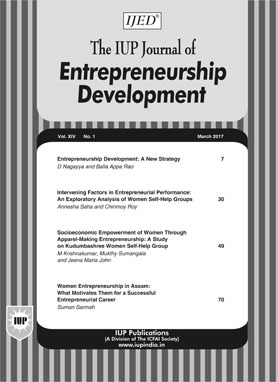 It is a quarterly journal that focuses on Entrepreneurship mindset, Development of entrepreneurship, Entrepreneurship opportunity, Motivation and case studies; Entrepreneurship growth and strategy; Entrepreneurial risk and reward; Entrepreneurship across culture/gender/economic status; Ethical and moral principles, guiding entrepreneurship behavior, etc. What Motivates Entrepreneurs and Can their Motivation be Influenced? Case Study - Philip F Anschutz: Entrepreneur with a "Contrarain Strategy"
Entrepreneurship development requires a network of different elements, and this network is known as the entrepreneurial ecosystem. Entrepreneurship ecosystem refers to the elements-individuals, organizations or institutions-outside of the entrepreneur that motivate or impede a person's decision to become an entrepreneur. Entrepreneurship ecosystems include the financial environment, government tax and support policies, government programs, infrastructure, dynamics and market capacities, basic and excellent education, Research and Development (R&D), and cultural and social norms. Improving the entrepreneurship ecosystem can boost economic growth through increased incentives for entrepreneurship and the development of small and medium-sized businesses. In this paper, the effect of elements of Iran's entrepreneurship ecosystem has been studied. The study is based on the data obtained from Global Entrepreneurship Monitor (GEM) reports, academic publications, reports, and publications of government agencies and other stakeholders in the field of entrepreneurship in Iran and outside. To this end, according to the 2007-2017 Global Entrepreneurship Survey on Entrepreneurship and the World Bank's Report on GDP, the problems of the Iranian entrepreneurship ecosystem, which hampered the economic growth, were examined. Based on the problems identified, it is suggested that existence of an organization with well-defined and transparent rules for financing entrepreneurs can save from the turbulent financial environment. Further, creating dynamic communication centers for linking industries and universities can improve the R&D transfer. The giant freshwater prawn (Macrobrachium rosenbergii), locally known as 'Golda', plays an important role in the economy of Bangladesh in earning valuable foreign exchange, generating employment and raising protein food production. The present study aims to assess the major barriers to freshwater prawn culture entrepreneurship in South-Eastern Bangladesh. A combination of participatory methods, including transect walks, focus group discussions and trend analysis, was used on prawn farmers and associated groups to assess prawn culture opportunities and its challenges for sustainable development. The results show that around 55,000 ha area of ponds is suitable for prawn farming with fish production in this region. Despite the great potentiality of prawn farming, lack of technical knowledge on pond management, prevalence of prawn disease, and unavailability of credit along with 14 barriers have been identified as the potential obstruction to freshwater prawn farming entrepreneurship. The findings also show that education of fish farmers, income from prawn culture, availability of information sources and knowledge on pond fish culture have significant negative relationship, while age and family size of fish farmers have positive significant relationship with the barriers to prawn culture entrepreneurship. Agriculture is the backbone of the economic system of an agrarian country like India. In addition to providing food and raw materials, it also provides employment opportunities to a large percentage of population. The present study discusses the various demographic factors of agriculture in three selected districts of Haryana-Kaithal, Bhiwani and Fatehabad. The various demographics studied in this paper will be of help to financial institutions to construct a decision base for institutional credit disbursement and generalization of the concept of entrepreneurship among the farming community in other regions. The case captures the entrepreneurial initiatives, inventions and growth story of Kevin Plank, who, in 1996, founded the firm Under Armour, a sports apparels firm which went on to take on the bigwigs like Nike and Adidas. The case is about the genesis of Under Armour and the various entrepreneurial aspects like product innovation, product branding, marketing, communications, etc. Under Armour's Sweat Wicking Cleats were placed not as mere sports apparel, but promoted as a performance enhancer-which struck the right chord with the target audience. The branding and positioning strategies ranged from sponsoring tournaments, sporting in movies, viral marketing, etc. The case captures the various marketing and branding strategies that Plank adopted to promote Under Armour's brand and its products. The competition in the sports apparel industry was fierce and had immense potential to affect Under Armour. The case also captures the challenges Under Armour faced, viz., competition, lack of continuous innovation, lack of patenting, etc.